During the Ottoman period, the people of Rhodopes suffered forced Islamic conversion, and their churches and monasteries were razed to the ground. But guerillas roamed the wide meadows of Rozhen, fighting to preserve the traditional Rhodopes way of life. Their efforts paid off, and today the locals are known for their traditional customs. People come here to enjoy local festivals and traditional bagpipe music by the famous Sto Kaba Gaidi group. The Smolyan Region is cradled by the magnificent Rhodope Mountains, which were revered as holy grounds during Thracian times, and as the birthplace of the mythical tragic hero, Orpheus. Ruins of the ancient fortresses built by the various Thracian tribes can still be explored today in the villages of Shiroka Laka, Smilian, and Gela along Mount Turlata. Smolyan shares a border with Greece and is mostly populated by Bulgarian Muslims. Winter sports enthusiasts come to the Rhodope Mountains, and the modern ski resorts of Pamprovo and Chepelare. The mineral springs in Devin and Beden are also quite popular. The unique architecture of Rhodopes’ traditional houses—with raised stone basements and pristine white floors —is picturesque. The culture of the Rhodopes people can be discovered in quaint villages near the mountains, where tourists come to take in the traditional cuisine, music, dance, and architecture. Rozhen is home to the Rozhen Astronomic Observatory, the biggest of its kind in the Balkans. Smolyan has a well-developed timber industry, thanks to the dense coniferous forests in the area. Textiles and machinery manufacturing are also important. Tourism is very important. Smolyan’s location in the Rhodopes makes it a prime ski resort town and a great place to observe the stars. The town continues into a narrow gorge of the Cherna River, in an area known as Smolyan’s Hollow. The Bulgarian National Astronomical Observatory (and its planetarium) is on Mount Rozhen. Smolyan’s Raykovo Quarter is a residential area and a craftsmans’ village with some architecturally important old houses. The town’s Rhodope Drama Theatre is a gathering place for local artists and actors, and The Rhodopi International Theatre Laboratory is held here every year. The beautiful murals of St. Nikola Church attract visitors as well. 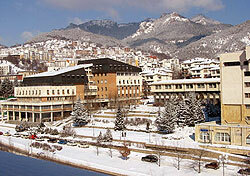 The Ustovo Quarter is Smolyan’s trade and market centre, with hotels and a shopping complex. Chepelare, on the banks of the river of the same name, has one of the longest ski runs in Southeastern Europe. It is not far from the popular resort of Pamporovo, but Chepelare has its own charms. In the summer, visitors come here to hike in the woods and go horse-back riding. In the winter, skiers and snowboarders take to the slopes, while novices take a few classes at ski school. Children go sledding or to the winter carnival, and many more are content to watch the professional skiing competitions that take place here during the snowy months. The Wonderful Bridges are another Chepelare attraction, but closer to the village of Zabardo: high marble arches and circular entryways carved from the remains of a marble cave by the river. The construction of a large motorway to Greece is expected to boost the number of Greek tourists to Chepelare and the rest of the Smolyan Region. Pamporovo is one of the most popular mountain resorts in Southeastern Europe. Near the pristine charms of its slopes are luxury hotels, bars, restaurants, shops and upscale residential areas.